View north to Castle Cliff fault and large gravity-slide blocks of Redwall Limestone (Tmc[Mr]). The gravity-slide blocks and enclosing Muddy Creek (Tmc) strata are tilted to the east. The Castle Cliff fault dips gently west and places highly sheared Mississippian Redwall Limestone (Mr) against Precambrian crystalline basement rocks (Xu). The dirt road to Welcome Spring traverses the wash below the nearest gravity-slide block and is visible at the right of the photograph. West of Welcome Spring, at the west edge of the Beaver Dam Mountains in southwest Utah, over a dozen enormous blocks of limestone stick up above the surrounding alluvial fans. The limestone is out-of-place and badly broken up, vividly showing that something unusual happened here long ago. Exactly how and when these large blocks of limestone got to be where they are is a fascinating story, and our collective effort to understand their history is also a reminder of how our science evolves through time. Visitors to Welcome Spring, an undeveloped yet popular camping spot at the east edge of the Basin and Range Province, probably pass by the limestone blocks with nary a thought to their origin, intent as they are on the welcome respite of water on the edge of the Mojave Desert. The spring is located a few miles north of Castle Cliff, where U.S. 91 (the old highway between Mesquite, Nevada, and St. George) exits the range via a route pioneered by the explorer Jedediah Smith in 1827. Heading southwest from Castle Cliff, Smith entered a broad basin sparsely covered with Joshua trees, yucca, cactus, creosote bush, and sagebrush that slopes westward toward Beaver Dam Wash. He called the wash Pautch Creek, which appears to mean “to walk in deep mud,” but it later became known as Beaver Dam Wash after once-plentiful beaver that lived in the creek’s mile-high headwaters area; the wash has since lent its moniker to the incongruously named Beaver Dam Mountains. The edge of this Joshua tree forest is where we find the large displaced blocks of limestone at the base of the range. The limestone blocks are adjacent to a structurally complicated part of the transition zone between the Basin and Range Province and Colorado Plateau. This part of southwest Utah is replete with unusual folds, faults, and shattered rocks that are the subject of considerable disagreement as to the relative influence of Late Cretaceous compressional deformation of the Sevier orogeny and late Tertiary and Quaternary extension of the Basin and Range. Ideas about the structural evolution of this region are chronicled in a report that accompanies the new geologic map of the St. George 30′ x 60′ quadrangle (currently in the final stages of review). Collectively, these ideas offer “…a wonderful illustration of how science progresses: not on a smooth trajectory, but in fits and starts and sometimes ‘backward’ steps, with long periods of accumulation of evidence and gestation of ideas, a certain amount of serendipity, occasional brilliant flashes of insight, and, especially in more recent times, technological advances” (quote from page 5 of Doug MacDougall’s book Frozen Earth—The Once and Future Story of Ice Ages). For now, in the Beaver Dam Mountains area, we are in that uncomfortable state of “long periods of accumulation of evidence and gestation of ideas.” But, our collective uncertainty about nearby structures need not concern us here, for now, nearly 70 years after their discovery, there is widespread agreement on the age and origin of one small part of this fascinating area—the large, displaced blocks of limestone west of Welcome Spring, which we now know to be ancient landslides (known as gravity slides). The largest gravity-slide blocks are several thousand feet long and range from a few tens of feet to about 200 feet thick—larger than many city blocks in size. They consist of Mississippian-age Redwall Limestone, as first reported by Brigham Young University student Spencer Reber in 1952. Where undeformed on the east side of the Beaver Dam Mountains, the Redwall Limestone forms bold cliffs and is conspicuously bedded with alternating chert and limestone. 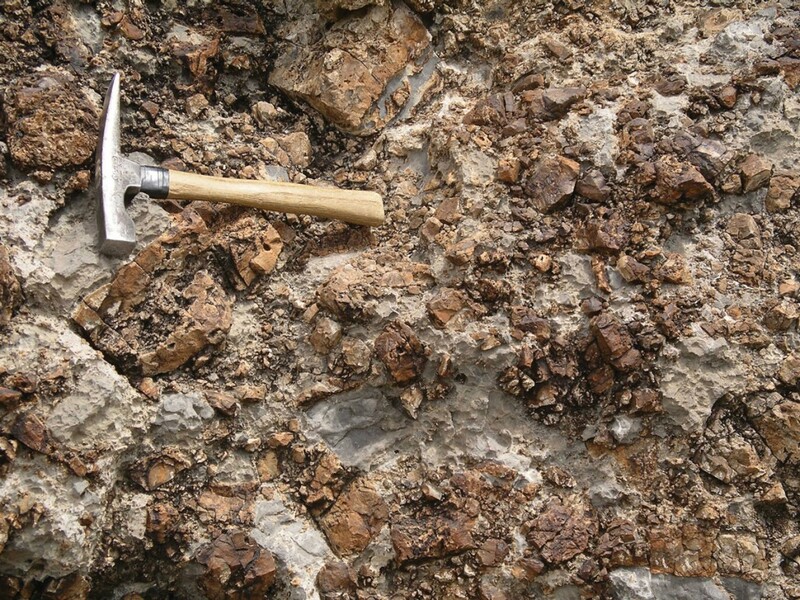 However, in the gravity-slide blocks, bedding is commonly destroyed and chert is concentrated in chaotic fractured masses (breccias) that contain little limestone. In the 1990s, U.S. Geological Survey (USGS) geologists Sharon Diehl and Ernie Anderson and their colleagues showed that the breccias are evidence of significant dissolution of the limestone layers prior to emplacement of the slide blocks. At the base of the gravity-slide blocks, a shear plane and a distinctive, thin, poorly sorted conglomerate is exposed; clastic dikes of the same conglomeratic material fill fractures at the base of the blocks. A good example of the displaced limestone blocks is immediately north of the dirt road to Welcome Spring. There, a large block of brecciated Redwall Limestone is sandwiched between alluvial-fan deposits of the Muddy Creek Formation; the whole package dips east, back toward the Beaver Dam Mountains. The gravels are mostly pebble- to boulder-size Paleozoic carbonate clasts, with red sandstone clasts (likely from the Kayenta or Moenkopi Formations), all set in a well-cemented reddishbrown sandy matrix. Interestingly, no clasts of the Precambrian crystalline basement are present in these deposits, even though today Precambrian rocks form the exposed bulk of the west-central Beaver Dam Mountains. Another instructive exposure about a mile to the northwest reveals interbedded fine- and coarse-grained Muddy Creek strata with a more diverse clast composition of andesitic volcanic rocks, Triassic and Jurassic sandstone, and Paleozoic carbonate clasts, but still no Precambrian clasts. Early workers believed that the gravity-slide blocks were the remnants of a late Tertiary thrust sheet emplaced from the west (the “fits and starts” stage of our understanding of these unusual features). We now know that the blocks were emplaced from the east by catastrophic landslides off the ancestral Beaver Dam Mountains in the late Miocene, 5 to 10 million years ago. Let’s work backwards to see how we can confidently make such an interpretation. Among our first observations is that the west flank of the Beaver Dam Mountains is carved from Precambrian gneiss and granite, so it is no surprise that young, Quaternary-age alluvial fans at the base of the range consist of cobbles and boulders eroded from these 1.8-billion-year-old rocks. The alluvial fans form an apron of sediment that slopes gently west toward Beaver Dam Wash and stands in stark contrast to the older Muddy Creek Formation, which both underlies and overlies the gravity-slide blocks. Muddy Creek strata are deeply dissected and show no geomorphic expression of their former depositional environments of alluvial fans and playas. The basin in which Muddy Creek strata were deposited no longer exists—it was part of an early episode of basin-range extension now overprinted by today’s basins and ranges. Another thing we notice about the Muddy Creek Formation is a lack of Precambrian clasts, which is a strong indication that the formation was deposited and the gravity-slide blocks emplaced prior to unroofing of the crystalline basement. This was first observed by USGS geologist C.E. Dobbin in 1939, who was investigating the petroleum potential of southwest Utah. Dobbin described the large block west of Welcome Spring, noting that it lies on limestone conglomerate of assumed Miocene age, and that blocks to the west lie on “…soft, whitish and pinkish deposits that may represent playa deposits of the same age as the limestone conglomerate.” More recently, however, some geologists interpreted some of these beds as being younger than Muddy Creek Formation (the important “backwards” steps that make us re-evaluate evidence thoroughly). Admittedly we lack fossil or radiometric ages for these beds at the west edge of the Beaver Dam Mountains, but the consensus now is that they are indeed the Muddy Creek Formation. It was Earl Cook, then a student at the University of Idaho, who in 1960 made several key observations that set our story on its correct course. Although none were definitive, collectively they suggested that the blocks were derived from the east by landsliding off the Beaver Dam Mountains, not emplaced from the west as the upper plate of a thrust fault. Then in 1963, Standard Oil Company geologist Robert Jones found kinematic indicators – folds and other structures – that confirmed an eastern source for the blocks. Jones was one of many geologists who were re-evaluating what the previous generation of geologists had interpreted as compressional features (highly unusual younger-over-older “thrust” faults), but that we now know to be related to extension (low-angle normal faults and gravity-slide structures). Another key piece of evidence came to light when geologists realized that the Muddy Creek strata also contain pebbles and cobbles of Navajo and Kayenta strata, and locally of volcanic rocks of intermediate composition, showing that those formations,in addition to Paleozoic carbonates, were once exposed in the source area of the gravity-slide blocks. Mesozoic and Paleozoic strata are not now present on the west flank of the Beaver Dam Mountains, and the nearest volcanic rocks are more than 10 miles to the north, indicating significant uplift and erosion of the range since deposition of the Muddy Creek Formation. In support of this idea, paleocurrent indicators also show that the coarse Muddy Creek sediments were derived from the east. The final piece of the puzzle came from a recently published paper (the “occasional brilliant flash of insight”) in which Columbia University geologist Mark Anders and his colleagues compared distinctive structures produced by gravity slides and seismically cycled faults and concluded that the brecciated and attenuated (structurally thinned) strata that make up the upper plate of the Mormon Peak detachment in adjacent Nevada represent an assemblage of gravity-slide blocks, not the remnants of a large crustal block bounded by a detachment fault. 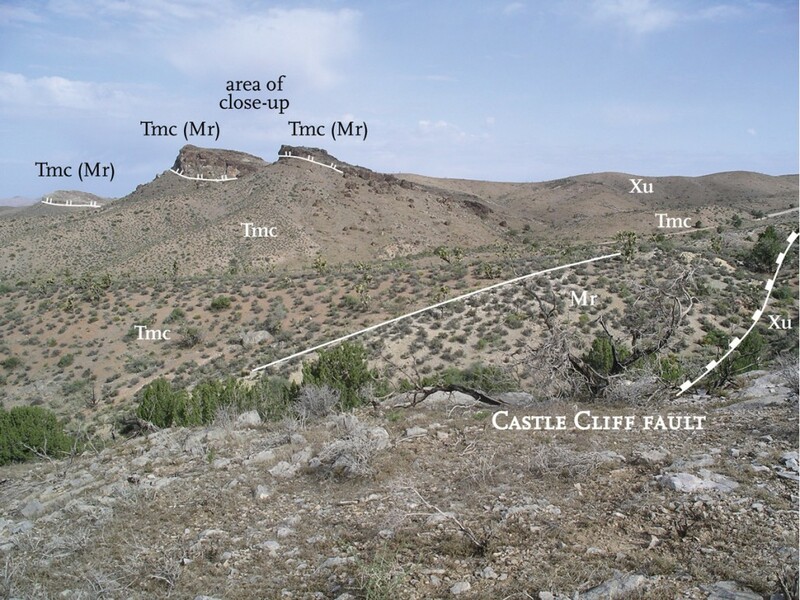 (The same could hold true for the nearby Castle Cliff fault and its attenuated upper plate rocks, but they have not yet been studied in such detail.) Importantly, Anders and colleagues also showed that the basal conglomerate below large gravity-slide blocks, and associated clastic dikes, formed by fluidization of granular material at the base of the slide and are unique features characteristic of many large gravity-driven slide blocks. 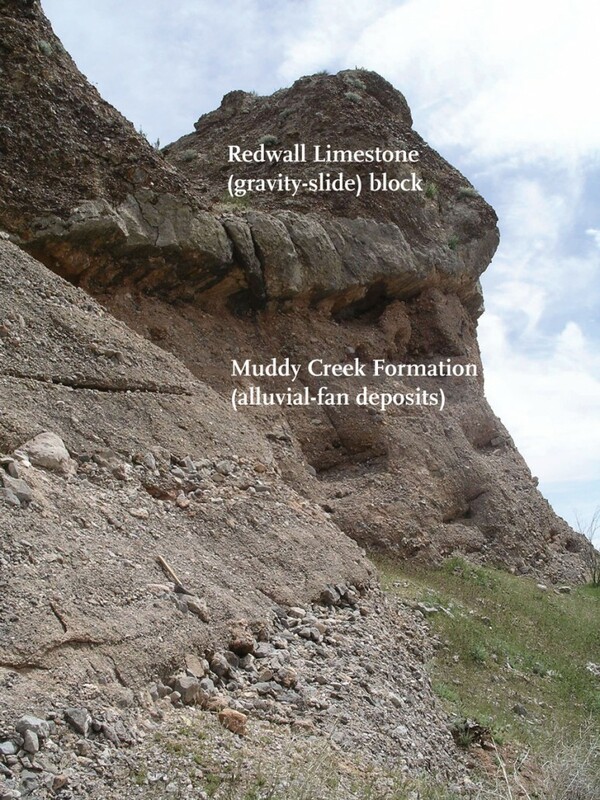 It is difficult to imagine enormous, city-block-size slabs of brecciated limestone bedrock catastrophically sliding off the mountain front and traveling a mile or more onto alluvial-fan deposits of the old Muddy Creek basin. What triggered the sliding is not known. Gravity sliding was no doubt facilitated by the attenuated and sheared nature of the Paleozoic strata that once was continuous over the crest of the range, and by the rapid uplift of the range early in its history. The large brecciated limestone blocks at the base of the Beaver Dam Mountains reflect a unique early episode in the history of the modern Beaver Dam Mountains. Today, the blocks stand as sentinels to Welcome Spring, encouraging visitors to ponder their remarkable past.